Thread-like semiconductor structures called nanowires, so thin that they are effectively one-dimensional, show potential as lasers for applications in computing, communications, and sensing. 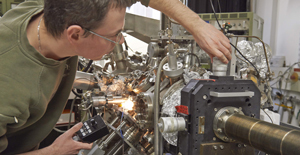 Scientists at the Physik-Department and Walter-Schottky-Institut of Technische Universität München (TUM) have demonstrated laser action in semiconductor nanowires that emit light at technologically useful wavelengths and operate at room temperature. They now have documented this breakthrough in the journal Nature Communications and, in Nano Letters, have disclosed further results showing enhanced optical and electronic performance. “Nanowire lasers could represent the next step in the development of smaller, faster, more energy-efficient sources of light,” says Prof. Jonathan Finley, director of TUM’s Walter Schottky Institute. Potential applications include on-chip optical interconnects or even optical transistors to speed up computers, integrated optoelectronics for fiber-optic communications, and laser arrays with steerable beams. 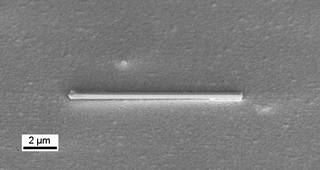 “But nanowires are also a bit special,” Finley adds, “in that they are very sensitive to their surroundings, have a large surface-to-volume ratio, and are small enough, for example, to poke into a biological cell.” Thus nanowire lasers could also prove useful in environmental and biological sensing. These experimental nanowire lasers emit light in the near-infrared, approaching the “sweet spot” for fiber-optic communications. They can be grown directly on silicon, presenting opportunities for integrated photonics and optoelectronics. And they operate at room temperature, a prerequisite for real-world applications. 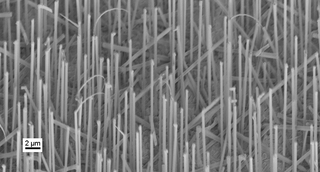 Tiny as they are – a hundred to a thousand times thinner than a human hair – the nanowire lasers demonstrated at TUM have a complex “core-shell” cross-section with a profile of differing semiconductor materials tailored virtually atom by atom. The nanowires’ tailored core-shell structure enables them to act both as lasers, generating coherent pulses of light, and as waveguides, similar to optical fibers. Like conventional communication lasers, these nanowires are made of so-called III-V semiconductors, materials with the right “bandgap” to emit light in the near-infrared. A unique advantage, Finley explains, is that the nanowire geometry is “more forgiving than bulk crystals or films, allowing you to combine materials that you normally can’t combine.” Because the nanowires arise from a base only tens to hundreds of nanometers in diameter, they can be grown directly on silicon chips in a way that alleviates restrictions due to crystal lattice mismatch – thus yielding high-quality material with the potential for high performance. Put these characteristics together, and it becomes possible to imagine a path from applied research to a variety of future applications. A number of significant challenges remain, however. 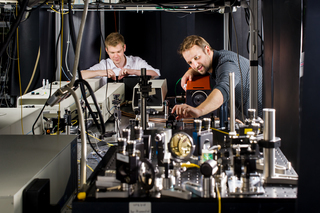 For example, laser emission from the TUM nanowires was stimulated by light – as were the nanowire lasers reported almost simultaneously by a team at the Australian National University – yet practical applications are likely to require electrically injected devices. 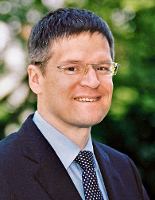 The newly published results are largely due to a team of scientists who are beginning their careers, under the guidance of Dr. Gregor Koblmüller and other senior researchers, at the frontier of a new field. Doctoral candidates including Benedikt Mayer, Daniel Rudolph, Stefanie Morkötter and Julian Treu combined their efforts, working together on photonic design, material growth, and characterization using electron microscopy with atomic resolution. Ongoing research is directed toward better understanding the physical phenomena at work in such devices as well as toward creating electrically injected nanowire lasers, optimizing their performance, and integrating them with platforms for silicon photonics. 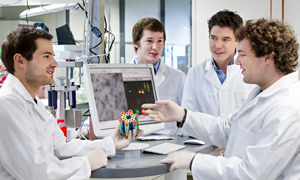 This research was supported in part by the German Excellence Initiative through the TUM Institute for Advanced Study and the Excellence Cluster Nanosystems Initiative Munich (NIM); by the German Research Foundation (DFG) through Collaborative Research Center SFB 631; by the European Union through a Marie Curie European Reintegration Grant, the QUROPE project SOLID, and the EU-MC network INDEX; by a CINECA award under the ISCRA initiative; and by a grant from Generalitat Valenciana.